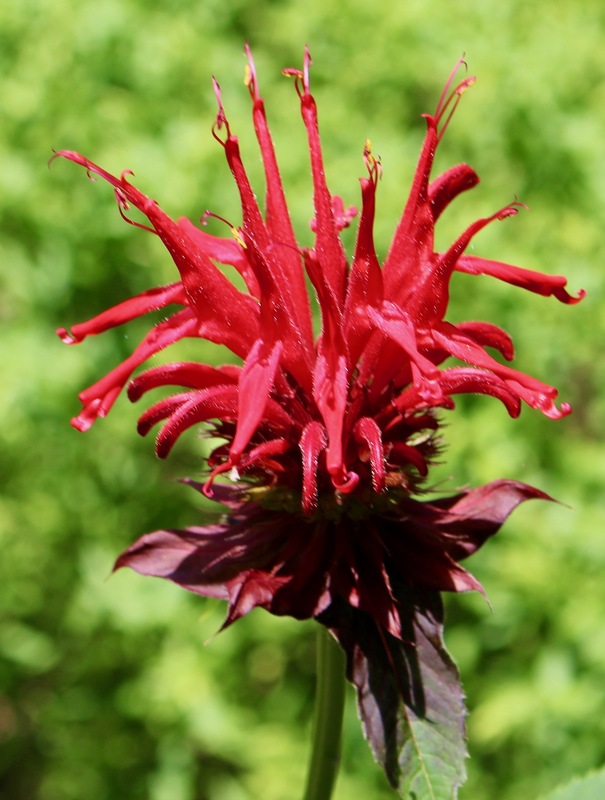 Scarlet bee balm (Monarda didyma) always looks like it’s wearing a party hat when in bloom. I always carry my camera with me when I step outside this time of year, even if I’m just walking the 100 yards to the mailbox. If I don’t bring it, some butterfly, bee, bunny, or bird does something photo-worthy that I don’t catch if I’m unprepared. These shots are what I caught today. I spent the morning working in the vegetable garden. I needed to work longer, but the sun is ferocious, the humidity unforgiving. Yesterday, I finally harvested our first squash and first two eggplants. We ate them last night and I can report that they were delicious. Today, I picked another eggplant, decided to give a couple of squash one more day to fill out, exhorted the tomato plants bent low with the weight of green orbs to hurry up and ripen, and rejoiced in sighting the first bean flowers on all three varieties I’m growing. A little photographic documentation follows. To enlarge a photo and see its caption more easily, click on it. 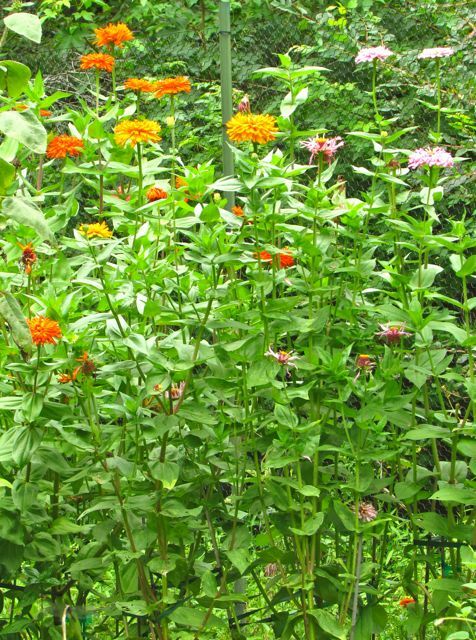 To get to the vegetable garden, I travel through the front yard and pollinator gardens. Here’s a sample of what I saw today. 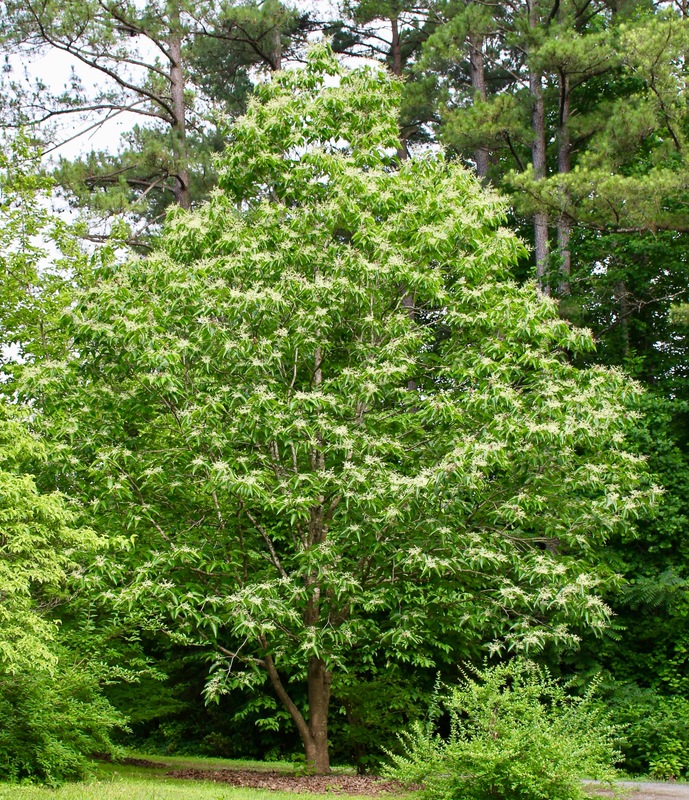 In the center of my front yard, the Chinese Pearl-bloom tree commands full attention as it nears peak bloom. We especially enjoy this time of year because of the near-daily emergence of tiny new amphibians from the front water feature. A few days ago in the early morning after a night-time shower, Wonder Spouse and I counted 25 hiding on various plants growing nearby. I suspect that most are Cope’s Gray Treefrogs, but I’ve heard other amphibians singing lustily beside the pond at night too, especially Narrow-mouthed Toads. When they are this tiny, though, I have no idea how to tell them apart. Some are green, but are they different species? I have no idea. Every day brings new discoveries, fresh food, and hard work. I wouldn’t have it any other way. This summer growing season has been a tough one for me. It started out slowly, because colder-than-normal temperatures lingered into early May. Then it stopped raining at my house for six weeks. During that time, my garden never saw more than two-tenths of an inch of rain, and that only every few weeks. We’re talking dust bowl. 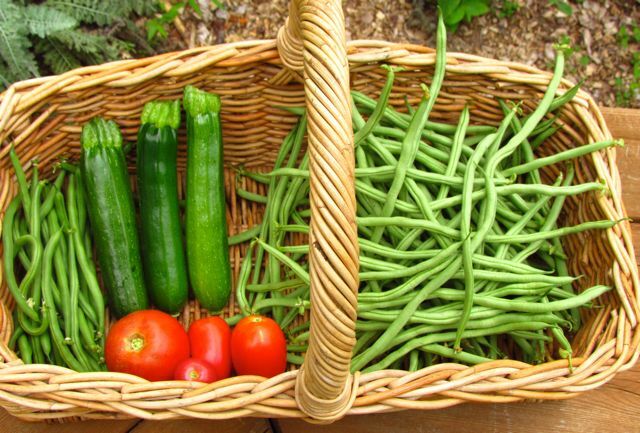 Add June temperatures that — for 16 days in a row — hit 90 degrees or better, with several well into the low 100s, and you’ve got seriously stressed vegetables. My zucchinis quickly expired. One day they were lush and productive; the next day they were wilted and dying. When I pulled them, they had almost no roots. I’m fairly certain the voles did them in. They also got one of my Carmen Italian pepper plants in the same bed. I’ve still got three pepper plants surviving, I’m happy to report. Finally, a few days ago in 48 hours, we got 3.5 inches of blessed precipitation. A tiny bit of dime-sized hail also hit us, but not enough to hurt anything severely. Strong thunderstorm winds also knocked things around a bit, but again, nothing that a bit of re-staking couldn’t repair. 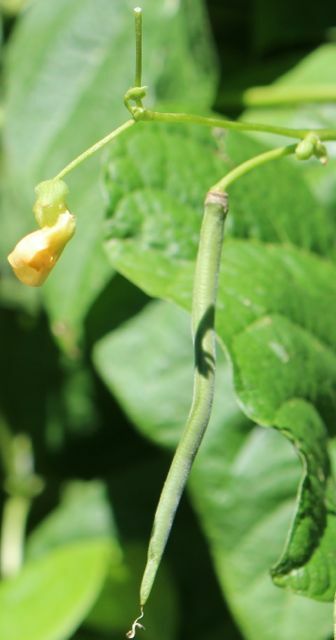 Fortex beans are blooming and setting fruit again, now that the heat has backed off. 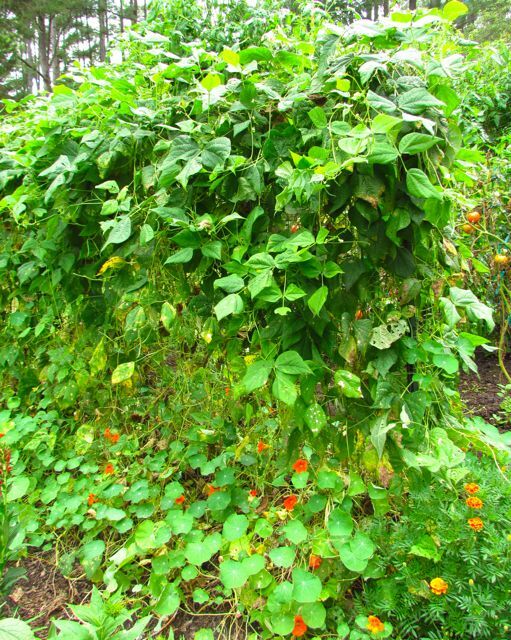 In the foreground of the photo above, you see the bean trellis. My Fortex pole beans on the right side have scaled the top of the trellis and are heading back down the other side. I grow Jade bush beans on the left side of the trellis. 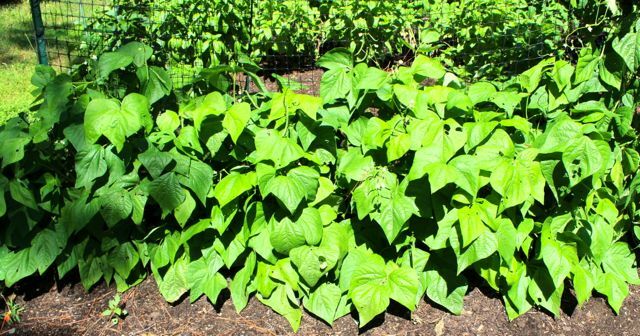 I long ago learned that so-called bush beans are not really bushy, by which I mean they don’t stand sturdily upright on their own. You must provide some kind of support. 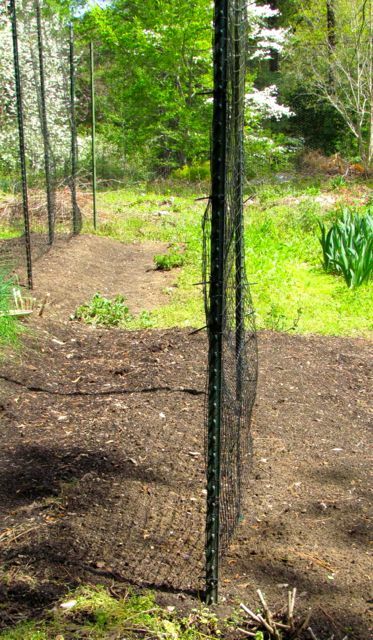 The simplest solution for me is to grow them on either side of a trellis and gently tie them to it as they grow tall and floppy. I have grown the same two varieties of beans for a number of years. I’ve tried plenty of others, but I haven’t found any that match the consistent quality of Jade and Fortex. The Jades produce a typical-looking green bean — a deep Jade green color. The flavor is rich, but lighter than the meatier flavor of Fortex pole beans. We eat them both lightly steamed, and the Jades are excellent cold in salads. This time of year, we eat beans almost every night — not just because we have so many, but also because they taste so darn good. Sweet Treats — the only cherry type I’ve grown for a while now. It is just too perfect to replace. La Roma II — this paste type is the latest version of a Roma. 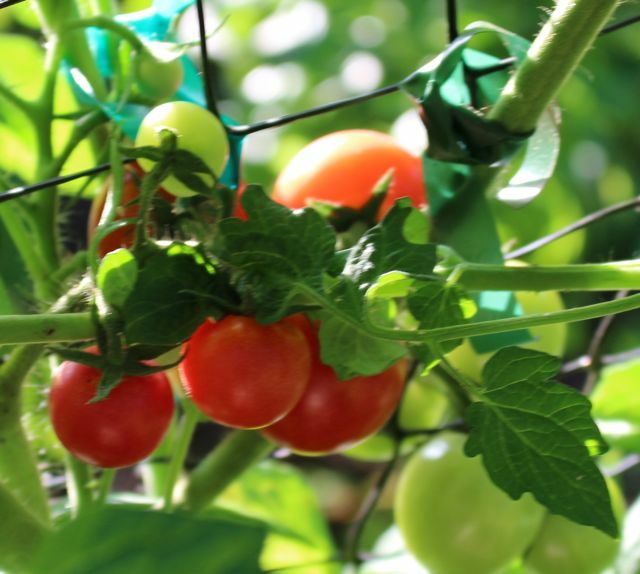 It is more disease-resistant, astonishingly productive, and this determinate tomato stays short, but bushes out in all directions to produce a fabulous abundance of fruits. The foliage grows so dense as the fruits ripen that I can’t take a decent photo of ripe fruits on the vine. 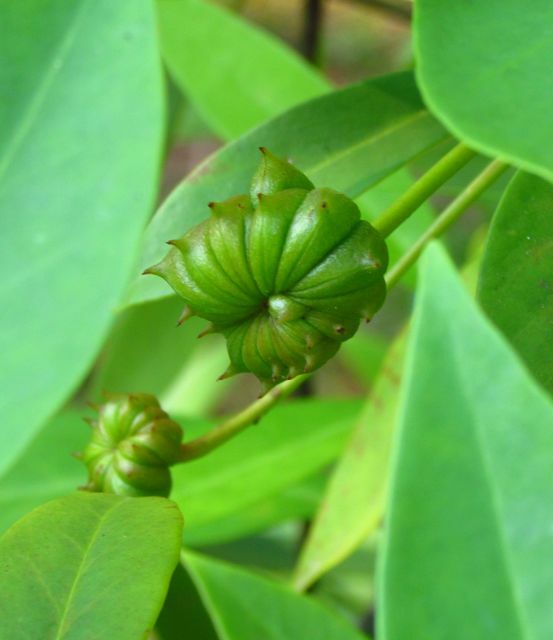 The one above was taken before the leaves covered the developing fruits. Early Blue Ribbon — this was a new one for me this year. I always try one early slicer type, always eager for summer tomato sandwiches as soon as possible. This one has been OK, but I won’t grow it again. My quest for an irresistibly tasty early tomato continues. Amelia — this is the larger slicer type I’m trying this year. The fruits are only now beginning to redden. I think the heat wave stopped them in their tracks for a while. They look promising, but our taste buds will be the final arbiters of this tomato variety’s future in our garden. Amelia tomatoes are just beginning to redden. I still have a few sad-looking carrot and beet plants in the ground, but the heat wave really pounded them. I’ll be amazed if they produce anything edible. Purple Viking potatoes still look vigorous. Wonder Spouse has not pulled his potatoes yet. The Purple Vikings still look vigorous, despite the heat. The Kipfel fingerlings and the Dazocs are looking kind of ragged. Wonder Spouse is planning to dig into them this weekend to get a sense of their tuber size and condition. Stay tuned for further developments. 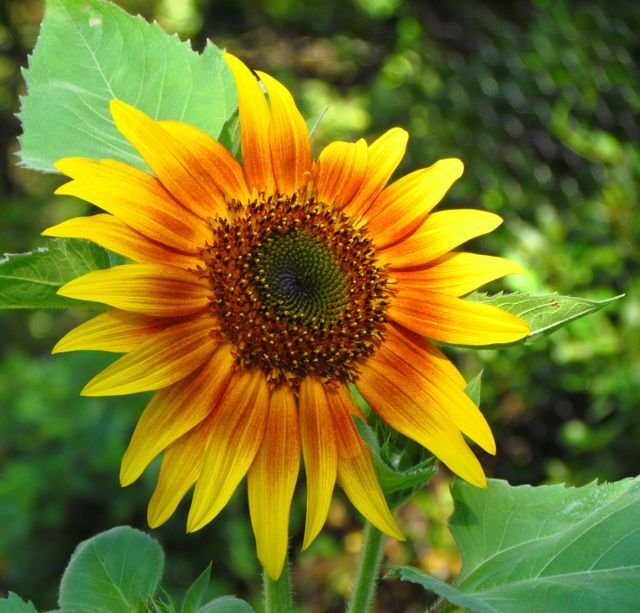 The flowers I grew from seed have hung in remarkably well with very little water from me. Some of the perennials are actually going to bloom this year, which doesn’t always happen. Early cold combined with prolonged heat and drought have very negatively impacted my large butterfly population. Finally, in the last two days, I’ve begun to see just a few, very ragged-looking larger butterflies. Here’s hoping their number — and appearance — improve soon. 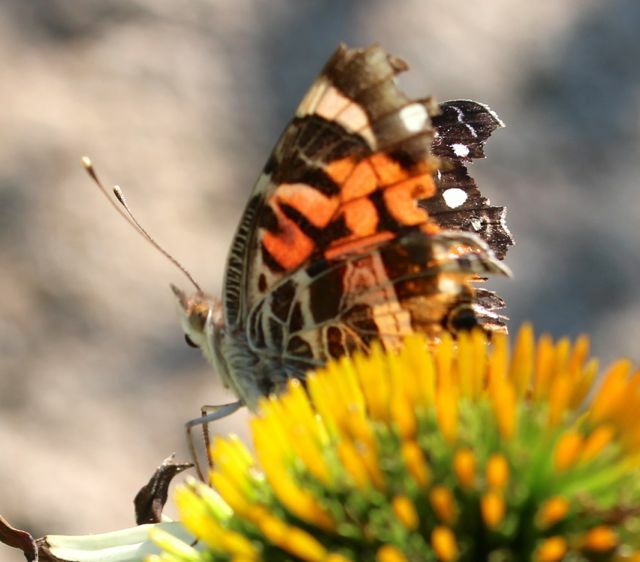 A ragged American Lady visits a coneflower. Have a great Fourth of July, ya’ll. An iris (name forgotten) thriving in a neglected corner of my vegetable garden. Is is just my yard, or is everyone seeing an explosion of growth from their gardens? There is so much to see that I really need to be outside every day with the camera. I am certain that I’ve missed peak moments of some of my spring beauties. 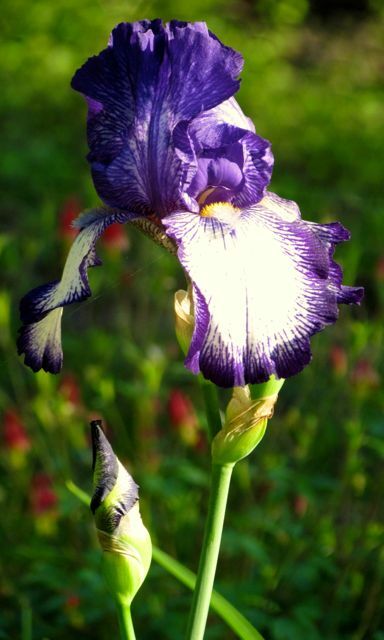 Everywhere I turn, I am wowed by another gorgeous flower — like that iris in the above photo. Long ago, I chunked some irises into a bed in my vegetable garden, thinking it would be nice to have a place for cut flowers and to bring in pollinators. I’ve forgotten the names of the varieties planted there, and most years, I am very slow to get their area weeded. But despite nearly complete neglect, they reward me with spectacular flowers every year. 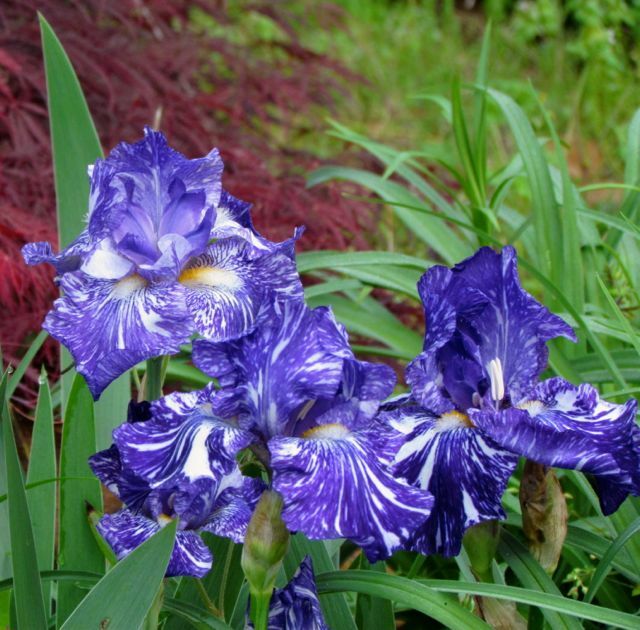 I love that about the bearded irises. These jaw-droppingly gorgeous blooms live in my front garden — another currently very neglected part of my yard. But do they complain? Never! They continue to multiply, blooming ever more magnificently every year. 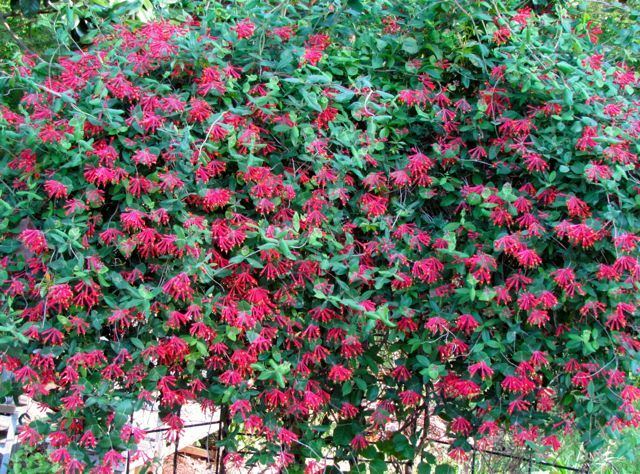 Another plant that stops everyone in their tracks in my front garden this year is the coral honeysuckle (Lonicera sempervirens ‘Major Wheeler’). It grows and blooms so wonderfully that I’ve had to prune it severely several times over the years to prevent it from pulling down the trellis it perches on. Why, you may ask, am I missing daily walks and neglecting beauties like those above? Two things: the vegetable garden and the greenhouse. As you may recall, my greenhouse was jam-packed with plants I grew from seed — veggies and flowers. However, in my part of NC, by early May, our temperatures are usually getting summertime hot. Even though the roof of my little greenhouse is covered by shade cloth and ventilated with a temperature-sensor-controlled fan — and I keep the door wide open during the day — temperatures get into the 100s in there pretty early. Thus, I’ve been in my annual race to get everything growing in the greenhouse planted and/or moved to their summer spots before they sautéed themselves in the greenhouse. I’ve been working dawn to dusk at least every other day (weather permitting) to achieve that goal. And I just finished yesterday. Yes, I am tired, and yes, my aging, overused joints are not entirely happy with me. But it’s done. 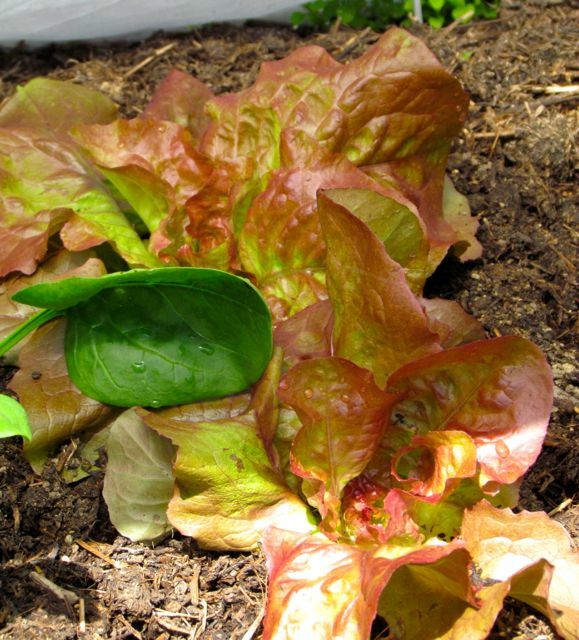 Every seed-grown start has been transplanted, watered, and mulched. Now it’s up to them and the whimsies of weather. Top priority was the vegetable garden. Food plants always trump flowers. If I do say so myself, that part of my yard is looking pretty darn good. See for yourself. 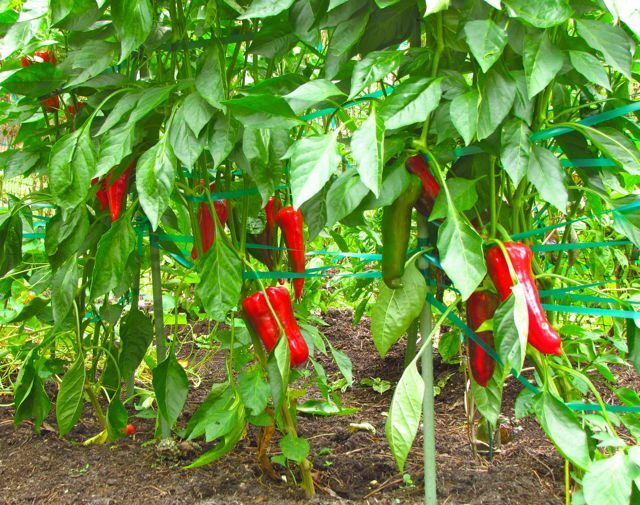 Squashes grow large within their tents, surrounded by peppers, flowers, and herbs. The Fortex pole beans are making excellent progress. It wouldn’t be summer without Fortex pole beans for dinner. 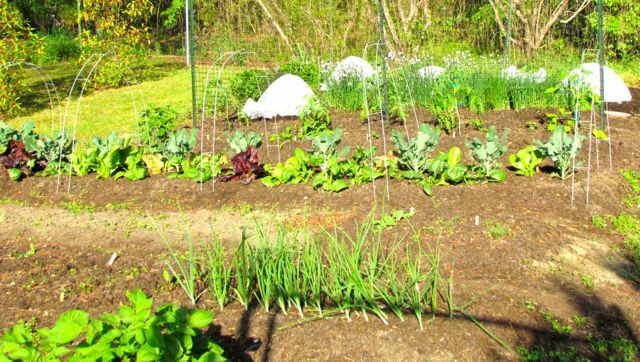 One thing I love about a late spring vegetable garden — everything looks so neat and tidy. 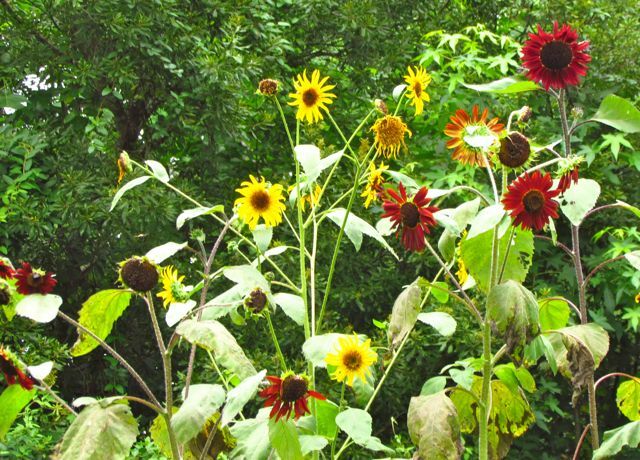 After the plants have grown a while, weather, bugs, and diseases create a more “lived-in” look. Potatoes in the foreground, onions, lettuces, and the summer veggies in back. Today is the first day my area will go into the 90s since last September. I have not missed those temperatures. Also, all the bugs are back — the good, the bad, and the really annoying — biting flies, gnats, ticks. It’s a jungle out there again, or getting there anyway. No more working dawn to dusk for this gardener. As summer temperatures settle in, I’ll be up at dawn for a bit of quick pruning, tying, watering, and harvesting, then back indoors by 9:00 a.m. Unless a rare cool spell stops by. Also stopping by this week, a couple of critters I don’t often see. A Red-headed Woodpecker hung around my yard for about 4 days, even sampling my suet feeders. I see them every once in a while, but they never seem to stay. I’ve always wondered if the Red-bellied Woodpeckers drive them away. A gorgeous Red-headed Woodpecker sampling my suet feeder. This other critter was trying to hide in my garage when I found him. I suspect he escaped from a load of wood chip mulch that I’d been spreading. That’s where these beetles live, so it was likely my fault that he was wandering around my garage. I relocated him to the mulch pile. I haven’t begun to enumerate all that’s showing off in my yard right now. The Ash Magnolia blooms will be open very soon. The deciduous azaleas are amazing this year. The swamp wildflowers are ridiculously enthusiastic, likely from all that rain they had last summer. I confess I spend my too-infrequent walks around the yard exclaiming over the loveliness of a bloom, the rate of growth of a particular shrub, the tiny discarded cones beneath my towering Dawn Redwood. Spring in my garden makes me a child again — surprised and delighted by every gift Mother Nature bestows on me. It’s been an exhausting couple of weeks, but Wonder Spouse and I have just about got the vegetable garden where we need it to be. Mostly, anyway. 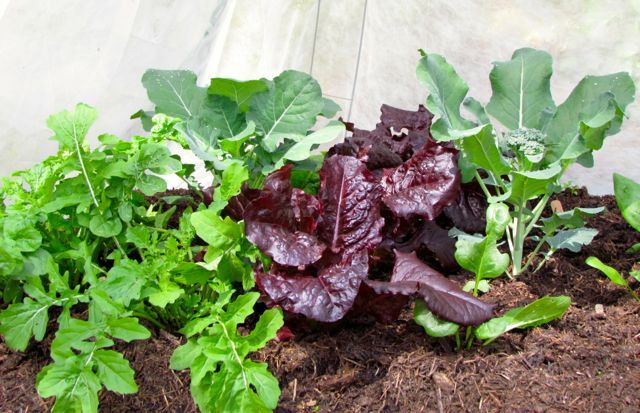 Certainly, the bed of lettuces, spinaches, arugula, and broccoli is doing very well. We’ve enjoyed a number of quite tasty salads. However, as usual, the arugula has already begun to bolt. It’s really too bitter to eat now, and I will force myself to pull it up as soon as the scary weather predicted for the next several days is safely past us. The spring garden was planted later than usual, because our darn temperatures wouldn’t stabilize, and because the ground was too wet to work longer than usual. 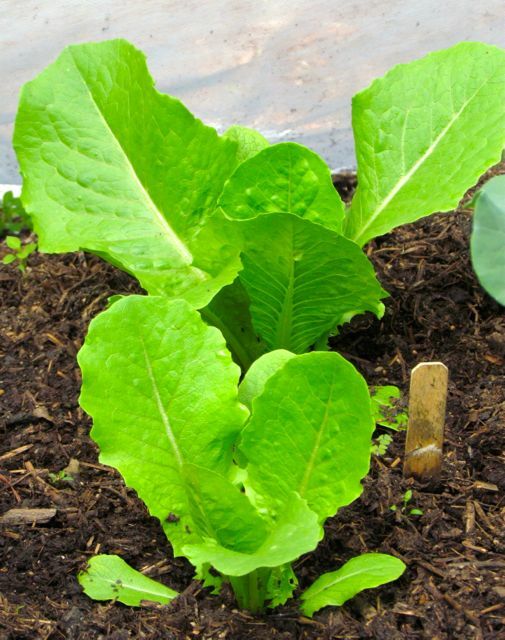 My greens are doing well, because I started them in the greenhouse and then transplanted them to their bed. But by the time I direct-sowed the beets and carrots, it was already about a month too late. They’ve sprouted beautifully, but the plants are still really seedlings. I am not hopeful that I’ll get much from them unless May high temperatures are much, much lower than normal. 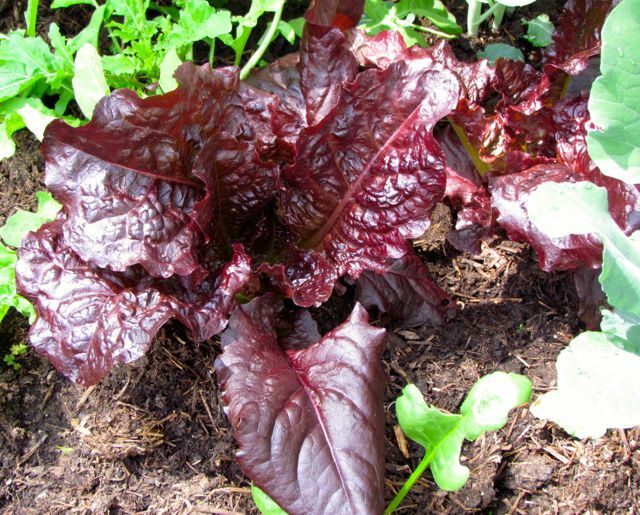 Annapolis Red Romaine Lettuce tastes as wonderful as it looks. Before the bag was raised to the next level. This past weekend, Wonder Spouse unfolded another third of the bag, filled in around the plants with the rich leaf mold/compost mix he devised, and counseled the plants to produce yet more tubers at this higher level. 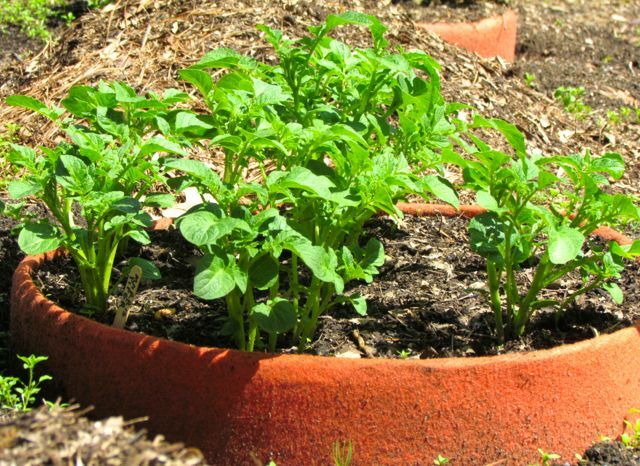 Ideally, the stems should sprout new roots and then potatoes along the freshly buried stems. Here’s hoping! The onion plants I transplanted in mid-March are doing well. I’m trying to be very attentive about watering them. For once, the well we use for the garden is full to the top, so I can be more generous with this precious resource than in recent past springs. Of course, as soon as the spring garden was in, I began weeding the beds set aside for summer vegetables and flowers. Weather — again — slowed my progress, as did my cranky joints. Alas, this aging gardener has discovered that repetitive gardening tasks are ideally allotted to alternating days, at least if I want to walk upright. When I saw the weather forecast for this week — basically, an entire week of rain — I knew that the tomato starts in my greenhouse would never last another entire week confined there. So, ignoring my joints and with the help of Wonder Spouse this past weekend, the tomato beds were power-weeded, planted, and mulched. 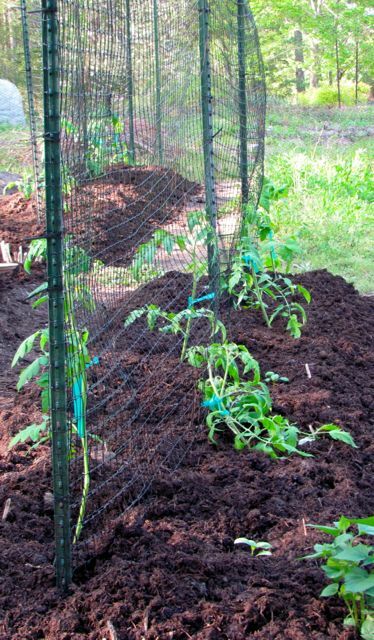 A weeded tomato bed before planting. It was chock full of earthworms. The tomatoes were hitting the roof of the greenhouse. 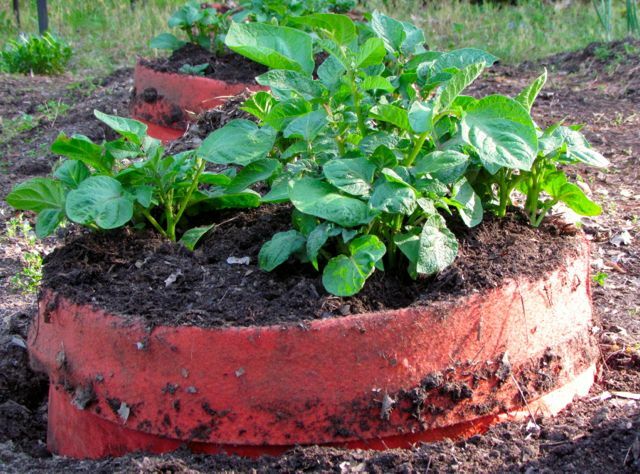 It is a very satisfying feeling to step back and admire a well-planted, well-mulched bed. Of course, now I will chew off my fingernails worrying about hail and damaging winds. Gardeners don’t need to go to Vegas to gamble; we gamble on the weather. 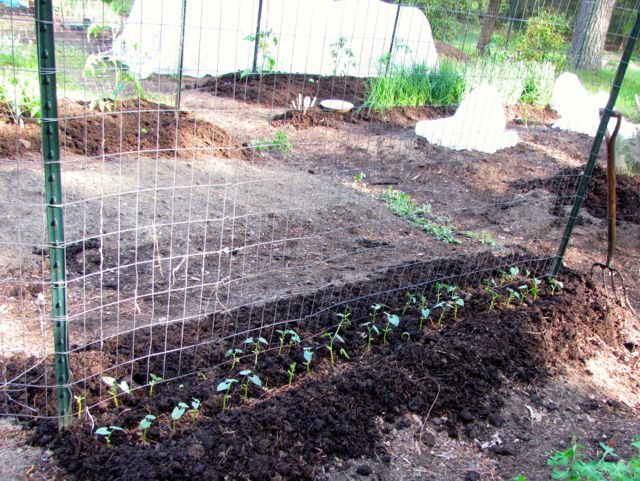 The first summer bed I prepared was for the Fortex pole beans. I think I planted them about two weeks ago, and I may have gotten 100% germination from them. I am excited. 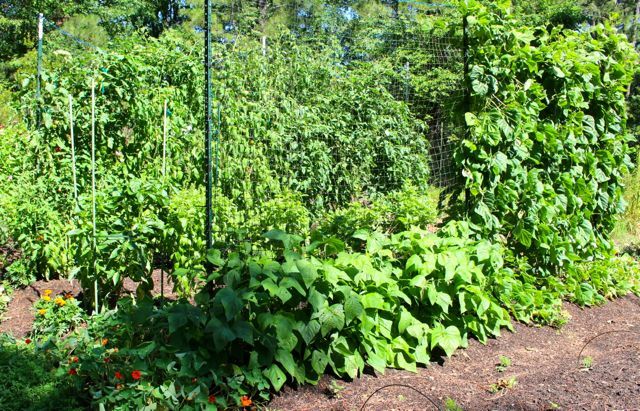 Fortex pole beans in foreground; much of the rest of the vegetable garden behind and beside them. I also got my squashes planted yesterday. I start them in the greenhouse, to ensure top-quality plants. 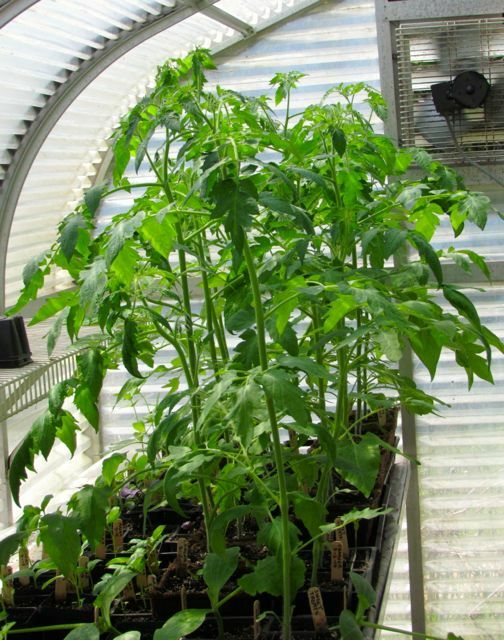 Direct-sowing isn’t a terrible option, but when you have a greenhouse, you might as well use it. I transplanted three plants each of two kinds of zucchini — Spineless Perfection, and a new variety for me — Dinja. 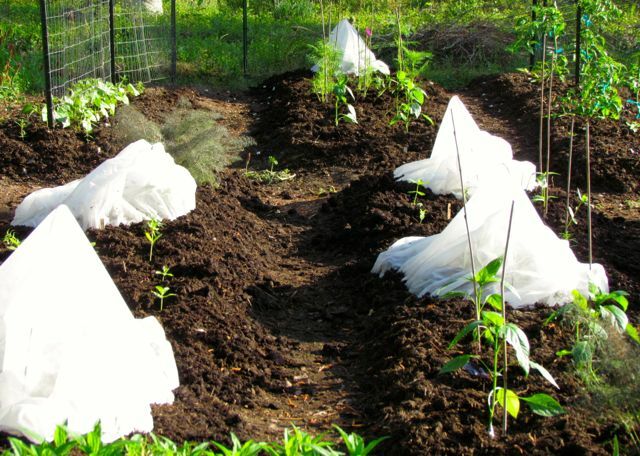 As soon as they’re tucked in, watered, and mulched, they are covered in their garden fabric tents to prevent insect pests from devouring the baby plants. As I explained here, the fabric comes off when the first flowers open. 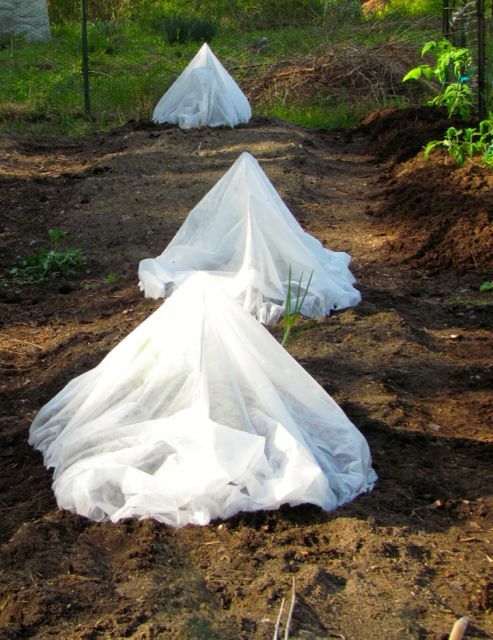 Safely tucked beneath their insect-proof tents, the squash plants can focus on unimpeded growth. I interplanted a few basils and marigolds with the tomatoes, but I have many, many flower and herb plants impatiently waiting their summer homes in my greenhouse. I can’t even think about their relocation until this terrifying weather pattern is past and the ground dries out. My area is predicted to receive 3-5 inches of rain. I’m praying my yard receives the lower end of that range. Several of the tomato plants were displaying their first open flowers when we transplanted them, so I’m praying that the weather will be kind, and I’ll be devouring fresh-picked tomato fruits soon. That’s about it for the veggie update. But I can’t close without mentioning the arrival of two species of birds that I associate with late spring — Rose-breasted Grosbeaks and Summer Tanagers. 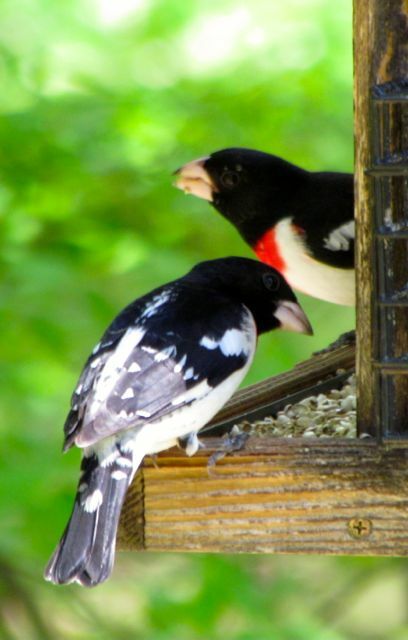 The grosbeaks visit for about two weeks every spring and fall on their migrations to their summer and winter homes. My well-stocked feeders are a favored stopover for them. The Summer Tanagers nest in my region every summer. I rarely see them, but I hear them often. They exchange a chipping call high in the treetops as they hunt for and devour the zillions of caterpillars that feed on the leaves of my canopy trees. I know summer is nearly here when the tomatoes are in the ground and the Rose-breasted Grosbeaks are visiting my feeders. My thoughts and prayers go out to the folks in the middle of the country being hammered by tornadoes. It is indeed a cruel twist of Fate that Spring is often as destructive as it is beautiful. Stay safe out there, ya’ll. Oh sure, the garden is thriving right this second. But I see Big Trouble heading this way like a runaway freight train. I’m talking about the 100+ degree heat wave promised for my area in two short days. Right now, the weather seers are calling for at least four days in a row with highs over the 100-degree mark, and five days in a row could easily happen. I wouldn’t be so worried, if I had gotten the rainfall that so many folks in my region have been blessed with lately. But I didn’t; not even close. Take last night, for instance. A cold front uncharacteristically strong for this time of year blasted through, bringing a line of thunderstorms to just about every yard but mine. I’m really trying not to take the rain snubs personally, but it’s getting harder and harder. My remaining Y-Star patty pan squash continues to produce well…for now. Absolutely no rain is in the forecast during the heat wave. Only the slightest of chances are hinted at for a WEEK FROM NOW! That means my already-too-dry soil is going to be baked by a merciless summer sun without any respite except what I can provide with my hose. 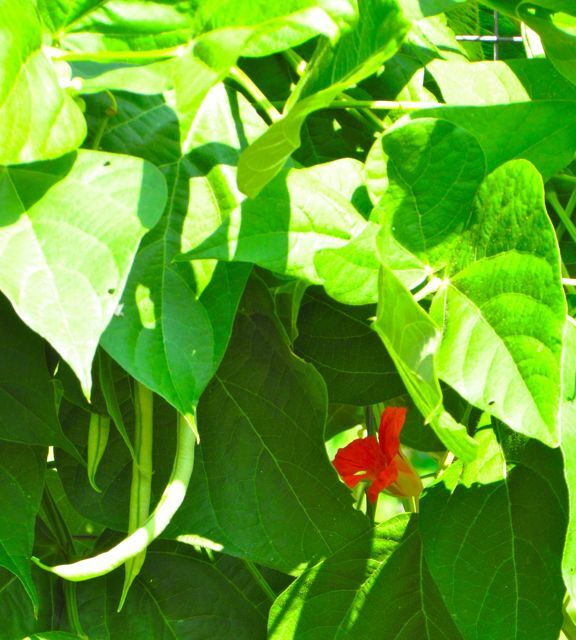 Fortex pole beans mingle happily with Spitfire nasturtiums…but for how much longer? I water my vegetable garden from a shallow well that draws from a perched water table overlaying my floodplain. It is not doing well; neither is the adjacent creek. Neither are the oak trees nearby; they are dropping young acorns by the hundreds in an attempt to reduce their water consumption. I am not sure how much longer I’ll be able to water my vegetables. Trees that produce fruit early in the season have been more successful than the oaks. For example, my Florida Anise-trees bloomed prolifically this year, and their fruit set has never been so significant. When the seeds inside the fruits ripen, I’m going to carry them down to the floodplain and spread them around to see if new trees will appear next year. I spent an hour in the uncharacteristically cool morning air thoroughly watering all the veggies. I’m hoping the good dose of water while it’s cool will allow the roots to maximize their use of the water, rather than lose it all to evaporation. I’m hoping this will fortify the plants against the imminent heat wave. I’ll water again in two days, next time at dawn so I don’t melt — if the well holds out. Every summer now I go through this agony, wondering how long the well will hold out. 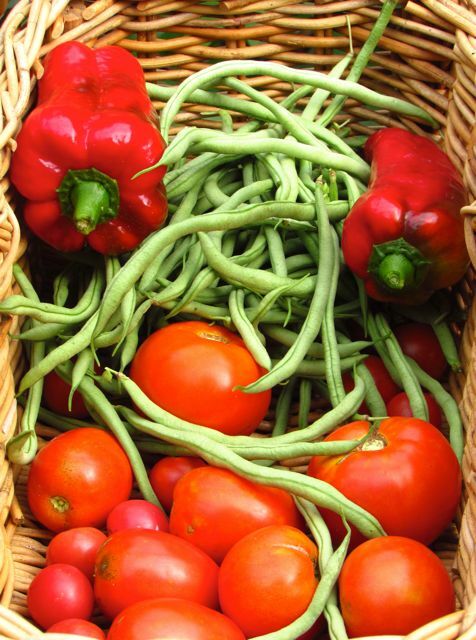 Will there be enough so that the tomatoes — just beginning to ripen in numbers — can be harvested? Will the peppers have time to ripen? How long will the beans keep producing? 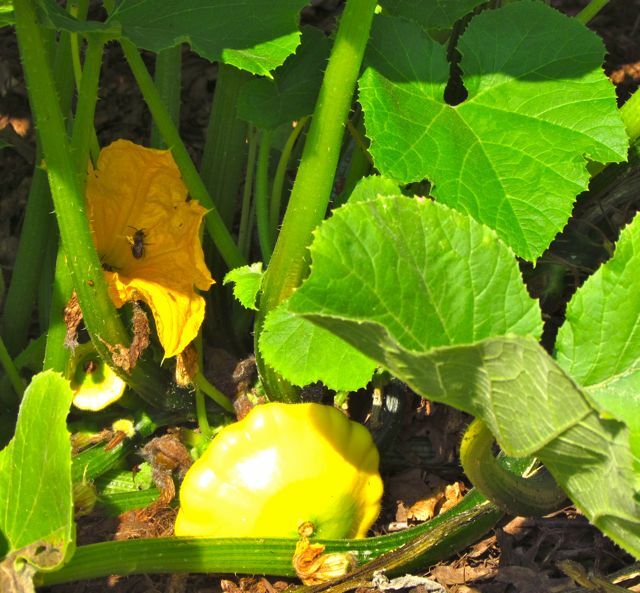 When will the bugs overpower heat-weakened squash plants? My yard has been in a drought for so many years now that I do not remember the last time my creek ran all summer long, when muddy spots on the floodplain would sink tractor tires during mowing, when summer nights were often accompanied by lightning flashes and pounding rain on the roof. I know the poor folks in Florida are drowning in Tropical Storm Debby’s rains right now. How wonderful it would be if I could wish those clouds here. Five inches? No problem; that’s what floodplains are for. Piedmont topography and soils are better able to handle such amounts. By this time next week, I expect to be hunkered down in a darkened house as I hide from searing sun and dream, dream, dream of rain. 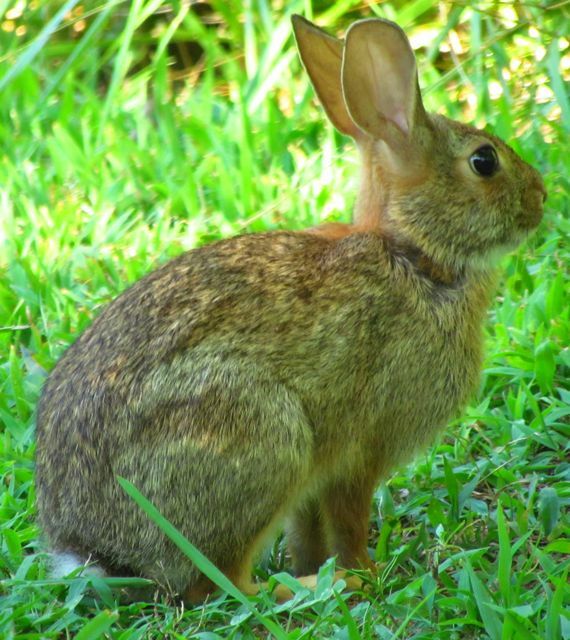 This bunny was outside my garden fence today wiggling its nose at the scent of well-watered veggies and flowers. You’re looking at 120 Fortex pole beans, 35 Jade bush beans, 2 Spineless Perfection zucchinis, 1 Raven zucchini, 2 Viva Italia tomatoes, 1 Sweet Treats cherry tomato, and 1 Early Goliath tomato. Yes, the summer vegetable garden is hitting its stride just in time for this Wednesday’s Summer Solstice. 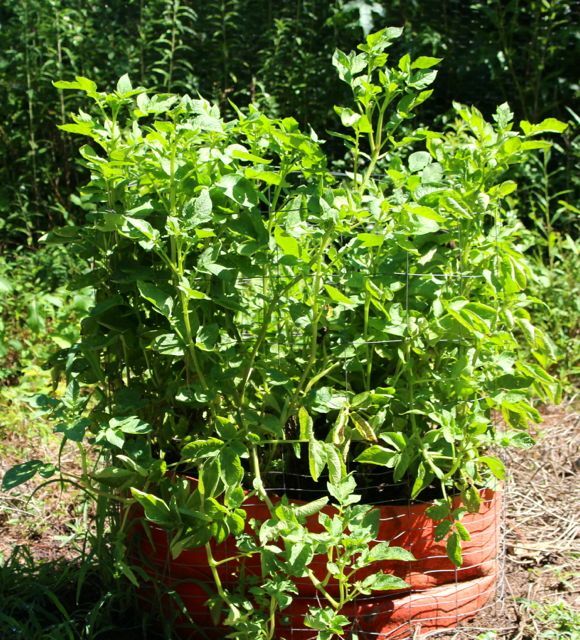 If the shallow well I use for watering the veggies doesn’t go dry, I’m predicting an avalanche of ripe tomatoes in about a week. But this is just an update for those keeping tabs on my garden. Today’s post is mostly about your questions — the ones I get via the search phrases you use to find my blog. WordPress’ statistics software conveniently tracks the terms you use to find my site, and over the last 7 days, I’ve noticed enough repetitive searches that I thought I’d try to address some of your issues. First up: Indigo Rose tomatoes. 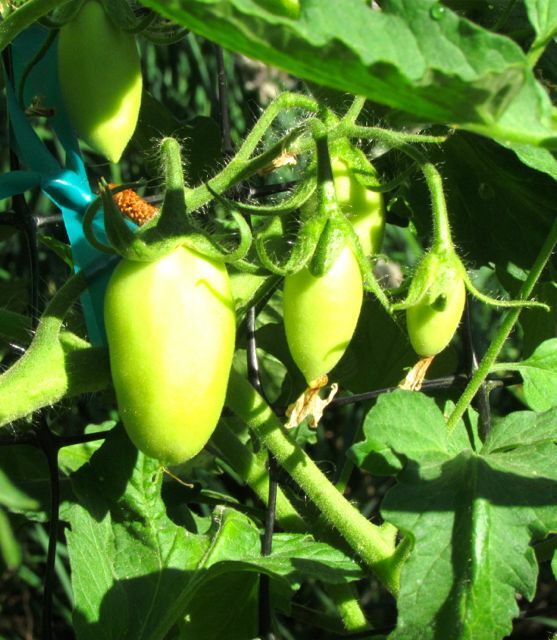 You folks find my site often by searching for information on this new variety of tomato. Many simply search on the name, but two other searches this past week caught my eye. You asked: Do Indigo Rose tomatoes taste good? And you searched on: My Indigo Rose tomato is slow to ripen. So I thought I’d share what I’ve learned. Like many of you, the picture and description of this new tomato variety in this year’s seed catalogs piqued my curiosity enough to make me try growing them. If you search on this variety within my blog, you’ll find several entries that apply, but I’ll summarize what I’ve learned so far here. First, the seeds didn’t germinate quite as enthusiastically as the other varieties I grow; I got a 50% germination rate, which is low for me. Second, the vines continue to grow well, but not nearly as fast as other varieties I grow. The other indeterminate varieties I grow send out many more growing shoots than my Indigo Rose plants. 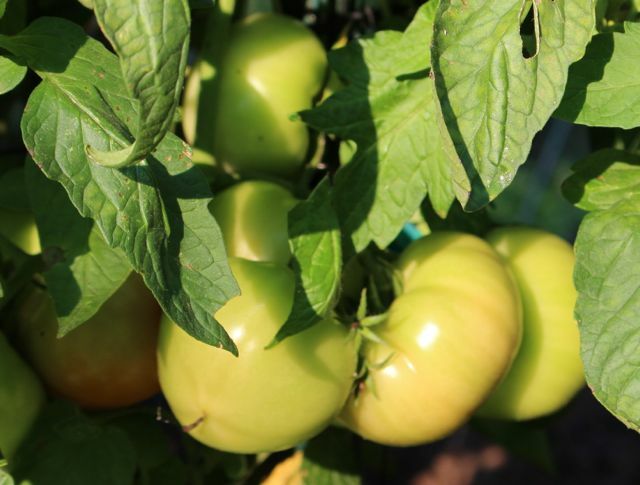 My theory — and I am totally guessing here — is that the purple pigment that colors the tomatoes and darkens the stems of the plants may reduce the amount of green pigment available for photosynthesis, thereby slowing the growth rate of the plant compared to more familiar tomato varieties. 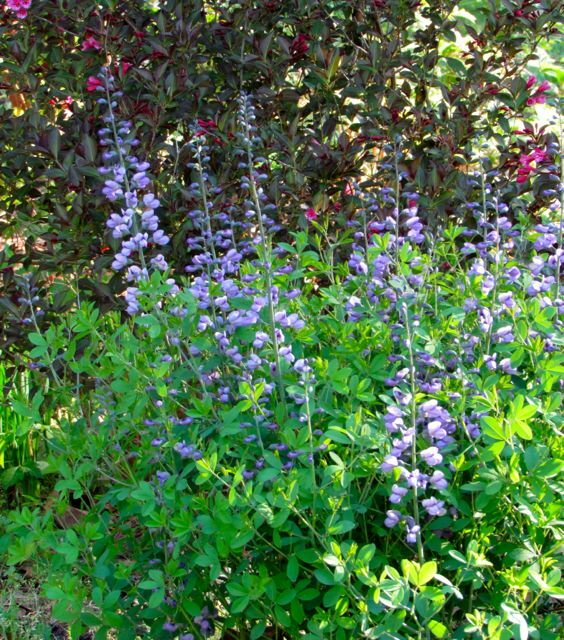 Third, the Indigo Rose plants set abundant fruit; the clusters contain quite a number of relatively small fruits. When the fruits fully ripen, I’m thinking their small size and unique color will make them ideal for salads. Note the hint of redness along the bases of the fruits. Thus, I advise patience to those searchers who are wondering why their Indigo Rose fruits aren’t ripe yet. You now have photographic evidence of what to look for. When they are fully ripe, I’ll be sure to post another photo in this blog. Obviously, I can’t speak to the taste of these tomatoes yet, since, like you, I’m still waiting for them to achieve full ripeness. Again, you’ll know when I know. I’m also seeing a big uptick in questions about squash growing. This doesn’t surprise me. My squash are beginning to be plagued by squash bugs, and I actually have already lost one of the Y-Star patty pan plants I was growing. The roots of that plant were destroyed by voles. These plant-eating rodents are the worst I’ve ever seen them in my garden this year. I blame this past nonexistent winter for their abundance. I’m also seeing a few bronze eggs on squash leaves, and when I watered yesterday, two squash bugs lurking at the base of a plant scurried up the stems to escape the water. I nabbed them quickly and deposited them in my bug extermination jar (filled with soapy water) that I keep in the garden this time of year. I wrote a long entry last year on everything I know about growing squash, which you can read here. But I do want to address a search question that arose this week. Someone searched on: sevin directly on squash vine borer and larvae. By the way this question is worded, I’m guessing that someone is confusing our two main squash insect varmints: squash bugs and squash vine borers. You can read all about the differences in that entry linked above. 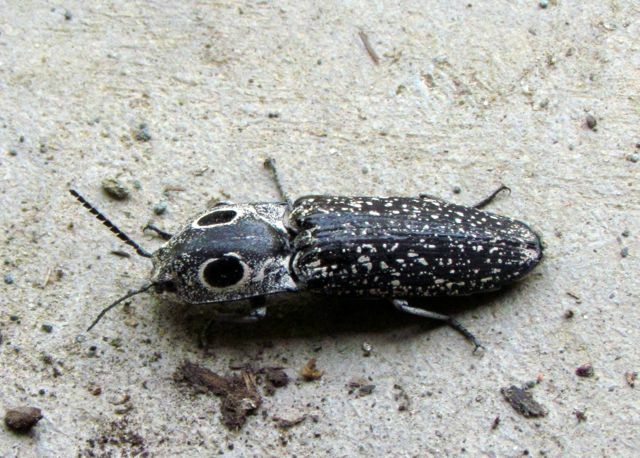 But know that borers are the larval form of a moth; squash bugs hatch from eggs as smaller larval forms of the adults. Because borers live inside squash stems, I can’t think of a way to get Sevin onto them. And although non-organic gardeners will tell you to put Sevin on squash to kill squash bugs, I think it’s a very bad idea. Sevin kills pollinators. If you want squash fruits, you need those pollinators. If you pile on the Sevin, you may have pretty plants, but you won’t get any squash. 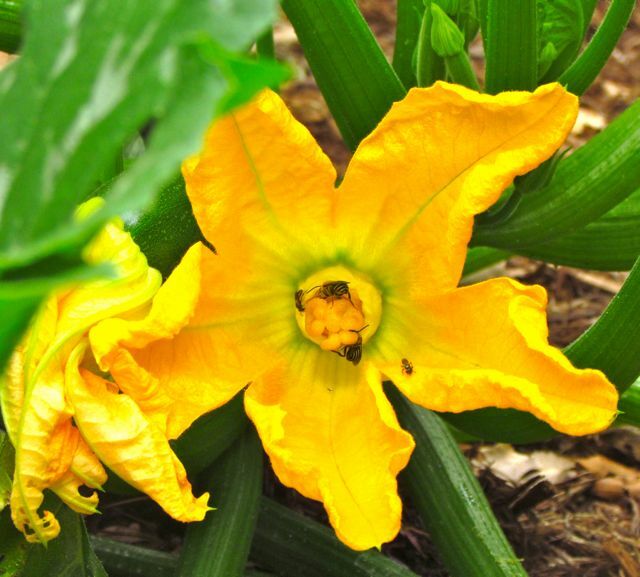 Squash flowers need visits from pollinators like these if you want squash for your table. One person searched on: brownish bronze eggs that have been laid on my tomato plants. These could be squash bug eggs. I’ve known the bugs to lay eggs on other vegetables, even my basils, although I don’t think they eat them. I’ll address additional search questions from my readers in future entries. If you’ve got a question you’d like me to answer, send it to the e-mail address I list on my About page. I’ll try to help you if I can.